AutoGearhead: You know why cars have been getting safer? Its because of a well-established testing program. In this article, you'll know about automotive crash testing. You'll be amazed at how much thought and preparation goes into making sure that safe cars are on the roads. A crash test is a form of destructive testing usually performed in order to ensure safe design standards in crashworthiness and crash compatibility for various modes of transportation or related systems and components. Frontal-impact tests: which is what most people initially think of when asked about a crash test. These are usually impacts upon a solid concrete wall at a specified speed, but can also be vehicle-vehicle tests. SUVs have been singled out in these tests for a while, due to the high ride-height that they often have. Offset tests: in which only part of the front of the car impacts with a barrier (vehicle). These are important, as impact forces (approximately) remain the same as with a frontal impact test, but a smaller fraction of the car is required to absorb all of the force. These tests are often realized by cars turning into oncoming traffic. This type of testing is done by the Insurance Institute for Highway Safety (IIHS), EuroNCAP and Australasian New Car Assessment Program (ANCAP). Side-impact tests: these forms of accidents have a very significant likelihood of fatality, as cars do not have a significant crumple zone to absorb the impact forces before an occupant is injured. Roll-over tests: which tests a car's ability (specifically the pillars holding the roof) to support itself in a dynamic impact. More recently dynamic rollover tests have been proposed as opposed to static crush testing. Roadside hardware crash tests: are used to ensure crash barriers and crash cushions will protect vehicle occupants from roadside hazards, and also to ensure that guard rails, sign posts, light poles and similar appurtenances do not pose an undue hazard to vehicle occupants. Old versus new: Often an old and big car against a small and new car, or two different generations of the same car model. These tests are performed to show the advancements in crashworthiness. Computer model: Because of the cost of full-scale crash tests, engineers often run many simulated crash tests using computer models to refine their vehicle or barrier designs before conducting live tests. Euro NCAP, Peugeot 3008 Crash Test: Frontal Impact takes place at 64 Km/h, 40% of the width of the car striking a deformable barrier. In the side impact, a mobile deformable barrier impacts the driver's door at 50 km/h. In the pole test, the car tested is propelled sideways at 29km/h into a rigid pole. Testing program is a technique to find out the faults associated with a specific product. Until and unless the product becomes flawless, it regularly undergoes the testing process. Similarly, automotive crash testing ensures the standard of a vehicle’s design in terms of safety. Companies perform several types of crash test. Before coming to the market, carmakers showcase their safety standard in public. 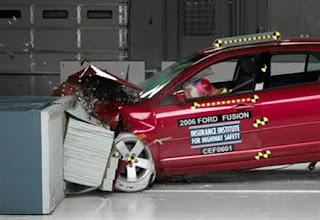 There are several players provide car crash test to safeguard the safety of the vehicles. Thank you for sharing. I didn't know these things.